Here, on Journey Jottings, we mainly talk about the second two – travel experiences and how to record those memories for sharing and future enjoyment. But some people don’t only journal after the event, they focus on effectively turning their dreams into plans before they go. Anne, of Pretraveller is the go-to person for pulling together your trip before you set off so I asked her, as part of my series of interviews with travellers who offer inspirational ways of recording travel memories, how does she create a pre-travel journal to plan a trip? 1. 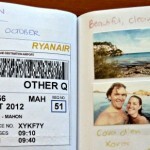 Why prepare a ‘pre-travel journal’ to plan a trip? The process of planning a trip provides me with almost as much pleasure as actually going! I enjoy coming up with travel ideas and seeing if we can make them work within our travel budget. it would be my travel spreadsheets. 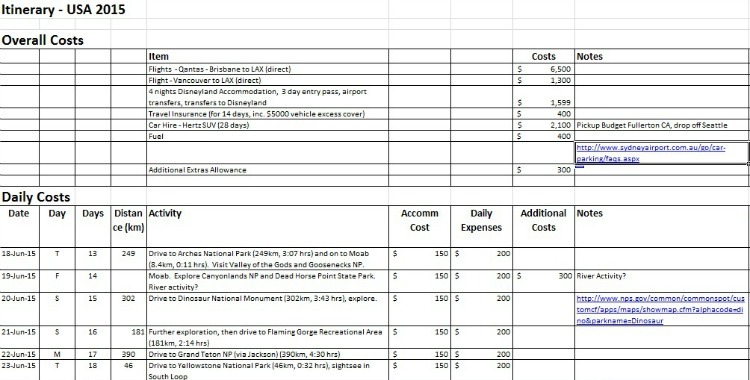 One of the first things I do when thinking about a trip is to put together a rough itinerary and costing. Depending on the size of the trip and my familiarity with the destination this can be either a quick or lengthy undertaking. Unfortunately as a family of five who can only travel during the school holidays if you want to fly anywhere the costs really add up quickly. For example my husband was keen on the idea of having a white Christmas in Europe. I put the spreadsheet together and for a four week trip it added up to over $A30,000. We decided that we really didn’t want to have to wait to save up that much money and that it would be better to do cheaper trips more often and save the Europe idea for the future. 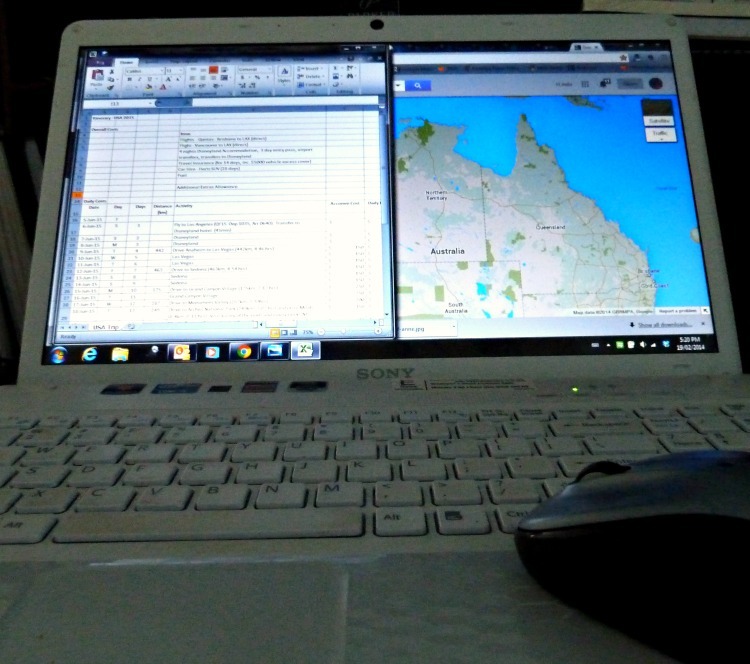 I have subsequently put together spreadsheets for shorter trips of approximately 2 weeks duration to central Australia, the Darwin region, the North Island of New Zealand and Vietnam as well as a few more local road trip options. For my family the costs for these trips start from about $A7,000 which is still a lot of money but is much more affordable. We intend to do one of these trips in 2015 once we have saved up the money required. With my husband returning to work we anticipate that we should be able to do a bigger trip every two years and still achieve our other savings goals. 2. What do you include as part of your pre-travel planning? In my travel spreadsheets I include a lot of web-links to the sites I’ve referenced. I usually also build up a specific folder of internet bookmarks for a particular trip. These days I mostly put things together on-line so it is unlikely that I will have much hard-copy material in advance of a trip. In the past we have bought guidebooks and maps etc as you can see below! Once we are in a position to start booking a trip I will also keep all of the booking details in my now more detailed spreadsheet and I will also start putting together a document holder to keep copies of booking confirmations. 3. How do you keep your pre-travel plans? While preparing for a trip my notes and information are mostly within my spreadsheet. When I shift from the top level planning phase into the detailed planning phase I usually go back through and revise the itinerary to confirm that it is still valid, and I also do a lot more on-line research for each place we intend to visit. Sometimes events happen which will cause me to change our plans. For example, we were booked to visit the South Island of New Zealand in 2010. One month before we were scheduled to depart the first Christchurch earthquake occurred. As you can imagine this caused me to revisit our plans. I had already booked accommodation in central Christchurch, so I quickly made a decision that I was not comfortable with that option any more and I cancelled that booking and rebooked into one of the airport hotels. We also reduced the amount of time we had planned for Christchurch and I also ended up reversing our route of travel. So we went clockwise around the South Island which also meshed better with my parents travel plans. We ended up having a great trip, but a few months later when the second Christchurch earthquake occurred and so many people died I felt that my decision to avoid staying in the city was justified. I also felt a bit of a near miss had occurred because we had briefly visited central Christchurch during our trip and some of the buildings we had visited were ones which later collapsed. 4. How far ahead do you start creating your pre-travel plans? I can create an initial spreadsheet for a trip sometimes years ahead of the actual trip, or even multiple trip options well in advance. My initial aim is to come up with ideas that my husband and I can discuss, and we then agree our travel budget allocation to save up for the trip and the likely year it can happen. We do not borrow money for travel or cannibalise our other savings goals so this step is really important. Once we have the money saved we then shift into the final decision making phase where if we have a few options that we are considering if a good flight deal comes up that will be a factor in our decision making. Once we shift into the decision making and booking phase my spreadsheets start to contain a lot more information. I usually lock in the critical parts of the trip first and then work through the less critical bookings in slower time. Now, this all sounds like I micro plan each trip but this is not the case. At heart I am a mostly ad hoc traveller. I still fondly recall my first trip to Europe where I walked off the aircraft in Berlin not even knowing where I was going to stay that night! All I had was a piece of paper with a rough itinerary of places I was interested in visiting so that I ended up in Rome on time to catch my next flight six weeks later. I did mostly stick to my itinerary but I made a few changes as I went along. and any obvious accommodation elements. I had also put together our planned itinerary but we were not locked into it. So I had information about points of interest along the way of things we may wish to visit. Some we did visit and others we didn’t visit. I was happy that we did not pre-book all of our accommodation as initially we shared three bedroom units with my parents. After a couple of nights it became obvious that we really need to be in separate accommodation so I changed my booking approach. But when my husband and I (pre-kids) visited Europe in 2001 we went in peak tourist season so we did pre-book a lot of the accommodation for the first half of our trip. For the second half we left it flexible as we were shifting to the shoulder season. 5. What is your favourite piece of pre-travel journaling equipment? My favourite pre-planning ‘equipment’ is Microsoft Excel and the internet. With these two tools I can create a trip plan for anywhere I want to go! 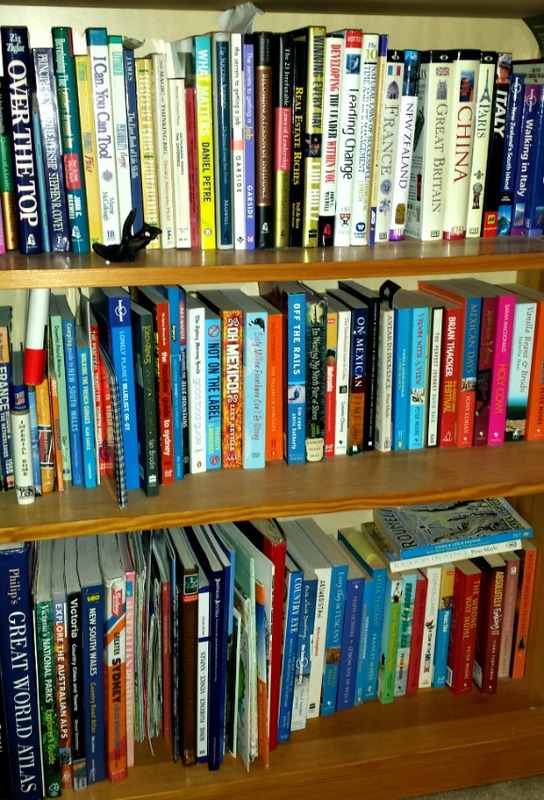 I do also utilise guidebooks – but in the early stages of planning I would try to borrow them from the library. 6. 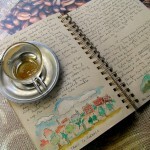 Why does pre-travel journaling work for you? I personally really enjoy the process of planning a trip right from the early stages to the actual trip itself. In my normal job I am an engineer and project manager so planning is an essential element of my work, so there is a natural fit to me being focused on the planning part of our trips. I don’t see myself as a ‘control freak’ – although my husband may disagree! What I don’t like is planning a trip which does not come to fruition – that only makes me feel frustrated! 7. And how about after the trip? How do you record that? I also like to journal my actual trip. Here are some of our mementos. These days I put together photo books rather than photo albums, and I can definitely say that photo books take up a lot less space on the bookshelf for more photos! I usually also keep a travel journal and collect other mementos as we travel. My husband is a keen amateur photographer so we usually end up with many many photos to choose from and he enjoys the process of taking, sorting and editing the photos. My job is to then put them together with captions and a story into the photo book. Anne Sutherland-Smith is a spreadsheet queen. On her travel blog – Pretraveller – she helps people travel with confidence and gives ideas and inspiration for travel destinations. 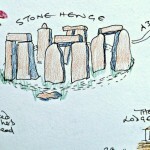 This entry was posted in Interviews with Travel Journallers and tagged planning, travel journal by Linda. Bookmark the permalink. I can see why people call Anne the Spreadsheet Queen. She is so organized! Thanks for sharing the step-by-step! My half-German-incredibly-organised-verging-on-OCD partner has created several Excel spreadsheets to plan our trips. One for diving, one for skiing trips, summer, winter trips… and I must admit when you’re herding 5 kids on holiday it’s VERY useful. We give the kids packing lists to check off, and each year we have a ski-gear fitting/hand-me-down session which is also recorded on a spreadsheet for us all to check off. It has to be said, a certain degree of pre-organization does go a long way to enjoying a smooth hassle free trip, particularly when as in your case there are multiple people involved! I love the planning phase of travel almost as much as the travel itself. I am also a big user of Excel, so don’t know why I haven’t used it as extensively as you do in planning. I will next time. The anticipation of an up coming trip is delicious! Maybe we should ask Anne for a template to kick us all off?!! Linda and Cathy, as a result of your request I have quickly put together a new page (link below) onto my site so people can download the Excel templates. I have also included a few examples to enable people to best use the templates. Wow ~ Anne ~ That’s amazing!! Linda, thank you for sharing my ‘pre-travelling’ approach. I really appreciate the opportunity to be featured. It is great to hear that there are a few other avid Excel users out there! Wow, this is so organised! I wish I could be like this, but generally our trips happen at fairly last minute notice as if to take ourselves by surprise, and I end up writing lists on scraps of paper that get dotted around the house. I think I’m going to re-read this post lots of time and really plan, and get my act together. Thanks for showing me the other side of the coin. I get a lot of joy out of travel planning, especially in the months when I’m not on the road. I love researching potential trips that are sparking some element of fancy, when like you, I’m land-locked! We cut out pictures of things we might see from travel brochures before our big trip to Central America, created our dream book from the images and poured over it with the kids to get them excited before we left. They appreciated it more having built up anticipation! Annabel, the anticipation of an upcoming trip is fantastic! And I agree that it also enables the kids to get involved and also get excited.